Due to unpleasant news because of the tension resulting from the accelerating events towards the aggravation and fueling of the situation with its complications, which will contribute to the spread of chaos that will not going to finish well, if the wise people cannot give precedence of reason and logic. 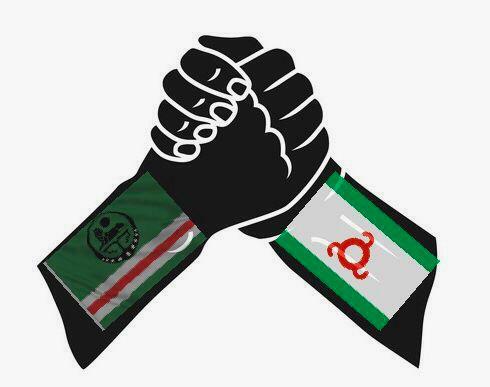 Justice for North Caucasus Group calls upon all the responsible parties, and stresses that in the absence of clarity of vision and convulsion, the sensitivity of the circumstances of the Caucasus region in general and the republics of Ingushetia and Chechnya in particular should be taken into account, and not to cling to the suspicious schemes based on a divide-and-conquer policy of spreading division between different parties. We appeal for the primacy of harmony and togetherness, and to put an end to all painful and unfortunate phenomena, and not to provoke the masses by all parties. We call for restraint, rule of reason, rejecting sedition and aborting all attempts aimed at influencing the lives of citizens as a result of changes that may be imposed by any change on the borders. That requires deep bilateral talks in order to reach a lasting peace between the respective parties. Likewise, all parties must also take into account the sensitivity of the circumstances in which the region is going through, and not to cling whether voluntarily or involuntarily behind suspicious schemes to what is the worst. The matter necessitates taking responsibility for resolving issues without noise and without abridging the right of any party. Hoping that everyone will practice self-restrain and prioritize the spirit of brotherhood, tolerance, solidarity and work on pacification, rationality and positive behavior. We must not leave to an ignorant or stalker any chance to penetrate for the sake of striking the historical fraternal cohesion, through intercommunication, compassion and human contact in order to prevent the recurrence of this painful scene in the future, which will plunge all the peoples of the Caucasus in chaos if it happened God forbid, where no one needs it. Everyone should work hard to deal with the situation drastically, so as to shed the curtain on the exceptional circumstance that has afflicted everyone, and to ensure the implementation of the laws in force, away from tension or abuse, to unmask the opportunity of the attempts of those who lead everyone to the unknown, which will destabilize the security of the region and will drive the situation to deadly consequences.